Versace VE1233Q eyeglasses feature an exquisite cat-eye shape with dazzling details at the temples; provides both style and comfort. Very Happy. The real deal for 1/2 the price. First time for me using Frames Direct. I will use from now on. I bought this frame for my daughter who loves Versace glasses. They look great and she loves the logos on them. And the price was inexpensive for this brand. I recently bought a Versace eyeglasses and very happy with my purchase. Product arrived earlier than expected in great condition. Price is much cheaper than the optical store I went to being it on very good sale price. Will buy my next one with Frames Direct again. I recently bought these and I like them. 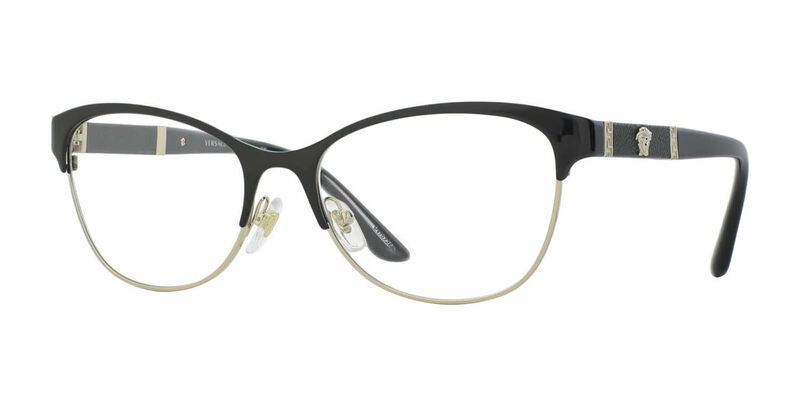 I ordered these frames being hesitant on how they would fit my face, they are perfect! So comfortable, and cute I almost fall asleep with them on because I forget I'm wearing them. I paid the extra for next day air and they came exactly as planned, the day of my mom's wedding. I can't wait to order the Versace sunglasses to match.